The Ammonoosuc Ravine trailhead sign located at the Cog Railway station. 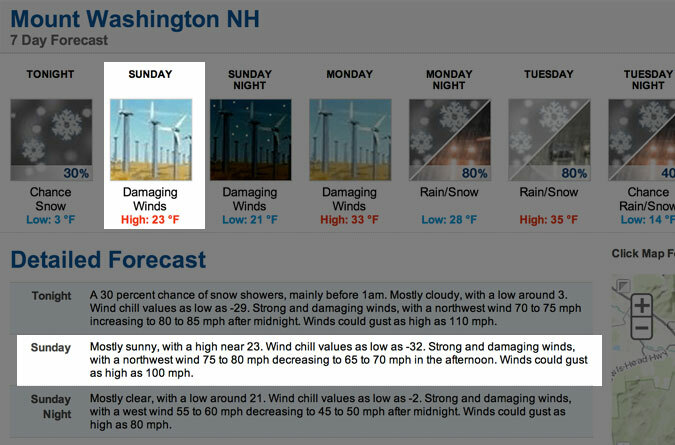 Bear in mind that “spring” is a relative term. While the snowbanks have finally retreated across most of New England, an early April hike finds winter in full bloom on Mt. Washington and its Presidential Range brethren. The 2.4 miles up the Ammonoosuc Ravine Trail to the AMC’s Lakes of the Clouds Hut, along with the .06 miles to the summit of Mt. Monroe and back, and the additional 1.4 miles to the top of Mt. Washington, altogether earn our Pack the Aleve difficulty rating. That’s when Mother Nature plays nice, anyway. When she doesn’t, you better believe it’s Sign the Will territory. Altogether the hike will occupy 7-9 unforgettable hours of your life. In the frozen months the White Mountain National Forest parking lot off Base Road is closed, requiring hikers to use the Cog Railway trailhead. Hiker parking is on the right just prior to the station’s main lot, with an access route that adds another .02 or so of walking to get to the trailhead. It was there that I set out a little before 7 a.m. knowing that the weather report was, well, questionable at best. The first mile of the hike paralleling the Ammonoosuc River is easy going. The trail was well packed with an occasional foot-deep post hole left after the last major storm. There was no ice so I managed fine bare booting; however, there are a couple tricky spots where the trail horizontally traverses a slope that could justify wearing micro spikes. A section of the trail along the Ammonoosuc River. The enshrouded mountain forecast what was to come. After the Gem Pool pool crossing the trail makes a steep turn up the mountain. Traction of some kind is likely needed in the winter/spring from here to the hut. I’d read a recent trip report on Views From The Top that indicated micro spikes would be adequate for the full Mt. Washington hike. Even so, given the weather forecast I wanted to travel as fast and light as possible without any equipment changes, so I’d only packed crampons to play it safe. Snowshoes that have spikes and heal bars wouldn’t be a bad decision, either, for anyone not conditioned to winter hiking. The steep Ammonoosuc Trail climb is easier in winter/spring than summer, thanks to the benefit of traction and the lack of often slippery ledgy rock. At one point it breaks out into an open spot at the top of a frozen cascade with the view of another icefall upstream. Continuing on toward the treeline the frosted trees shrink and the winds increase, very much feeling like one is climbing The Wall into an uninhabitable land complete with wildling skiers. 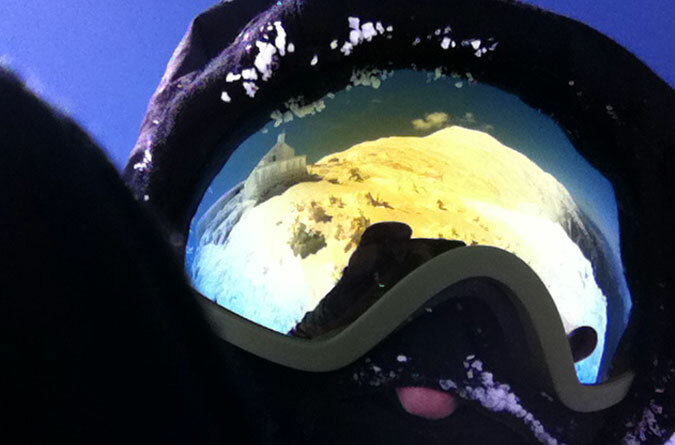 Amidst the wind’s ever-present warning whistles, I geared up with my hard shell, balaclava and goggles. The hut’s frozen fencing first came into view through the clouds, looking very much like baleen from a great white whale about to swallow me whole. The front, Appalachian Trail side of the hut was completely snowed in, but still offered a welcome reprieve from the wind. Needless to say, the Lakes of the Clouds Hut isn’t open in the winter. It was decision time. The path beyond the trail sign—let alone Mt. Monroe—was hidden in the clouds, but the wind didn’t seem quite as “damaging” as the NOAA suggested. I felt confident enough in my previous knowledge of the terrain to venture toward Mt. Monroe, promising myself to turn back if it got too rough. The Appalachian Trail/Crawford Path junction at the Lakes of the Clouds Hut, looking in the direction of Mt. Monroe. Photographic evidence that I made it to the summit of Mt. Monroe. On my way down Monroe I met three ascending hikers who told me they were planning on summiting Washington. To this point the only being of alleged intelligence that I’d seen on the mountain was me, and as everyone knows, crazy loves company, or something like that. Suddenly my declaration of skipping Mt. Washington was starting to crack. Still, there was no guarantee these fellows were going to stick to their plan, and so after much hemming and hawing back at the hut, I started to descend the Ammonoosuc Ravine Trail. I didn’t get far. My internal monolog turned to used car salesman mode, wheeling and dealing the turnaround criteria I’d abide by if I gave Mt. Washington a shot. While I’m making light of this in a feeble attempt to be funny, it’s important to note that in all seriousness Mt. Washington can be a dangerous place any time of year, and all hikers should know their limits and more importantly have an exit strategy they’re willing to follow. The one aspect of the forecast in my favor was that the clouds were supposed to clear as midday approached. I knew I’d be kicking myself for a whole year if I got to the parking lot and Mt. Washington was surrounded by blue skies. And so I turned around, telling myself that I’d abort if the wind was overwhelming or at any point I was questioning how to get back. The good thing about this route up Mt. Washington is that the cairns are quite large and spaced fairly close together. An exception to this is a stretch of Crawford Path right after the hut. What can also be confusing in cloud cover is the many cairn-marked trails criss-crossing the upper cone. I ended up accidentally veering off the Crawford Path onto the Crossover trail, and at one point nearly took the Davis Path in the wrong direction, before cleaning off a sign and proceeding with confidence toward the summit. Fortunately I was rewarded for the decision to proceed. The sun started breaking through and the clouds began to lift as I approached the summit. The winds, while not quite damaging, were still forceful. The ever-so-quick Mt. Washington summit selfie. After the summit I made the mistake of venturing out onto the observation deck to get a photo of the northern Presidential Range. Half way across I was absolutely blasted and yanked sideways by the wind. The crampons were the only thing keeping me upright. I couldn’t help but think there was someone in the Yankee Building getting a good laugh at my expense. Looking out over the Mt. Washington Visitor Center. The observation deck can be seen on the left. The historic Mt. Washington Stage Office, built in 1908. A clear view looking out over Wildcat Mountain and the Carter-Moriah Range. I tried to get across the snow cat tracks for a better shot but once again was thwarted by the wind. A shot of the snow cat for my son. Descending via the Jewell Trail for a loop hike is a popular option because it offers views of the northern Presidential Range, including Mt. Jefferson, Mt. Adams and Mt. Madison. The open section from the Jewell Trail’s intersection with the Appalachian Trail and treeline can be tricky in winter when visibility is compromised, so I made the safe choice (see Mom, I can make good decisions) of going back the way I came. I’ll let the photos tell the rest of this story from here. The southern Presidential Range broke free of the clouds on my descent. Looking out over the Davis Path. The ridge beneath Mt. Clay where the Jewell Trail is located. Mt. Monroe looked quite different on the way back through. One last peek at the Mt. Washington cone before heading down. The Goggles-eye view of Mt. Washington and the AMC’s Lakes of the Clouds Hut.